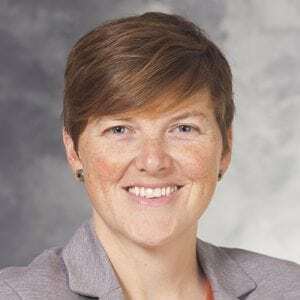 Stevie Marvin, MS, CCC–SLP, is a speech-language pathologist with the Department of Surgery – Division of Otolaryngology. She has specialized exclusively in adult dysphagia evaluation and management since 2007. She has clinical competencies in videofluoroscopy, fiberoptic endoscopic evaluation of swallowing (FEES), high resolution pharyngeal manometry (HRPM). She provides care to a variety of patient populations in the inpatient and outpatient settings. She is currently involved in multiple research projects including research on post-extubation swallowing disorders in the Trauma and Life Support ICU at UWHC.